luminous in my chaotic dreams(life): It’s Coming! Good afternoon, hope all is well with you! I know, I’ve been MIA for a bit. I finally got a gorgeous new craft desk and it’s taken me since Sunday to get my room together-PHEW! I’m so glad that’s done. So today SSD is sponsoring Penny’s Paper Crafty with the challenge is use 2 or more DP’s. It’s Coming! Fall that is! And with that comes Halloween-woo hoo! I love this time of year. So for my card I used The Mistress of the Night image. I know the colors look off-sorry about that! The sketch is from Mojo Monday, I just flipped it. 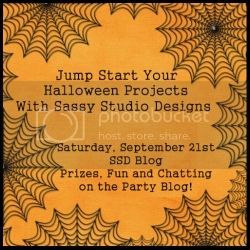 So, for some other news-the other part of It’s Coming-a new release from Sassy Studio Designs will be here Saturday the 21st. Don’t miss it, they are so cool! There are 3 new designs and one that has been updated! Love these Sassy images and you've showcased her perfectly!!! Thanks so much for joining us at The Sisterhood’s ‘DEVINE DIGIS’ challenge and please come back again soon! Love your card, Thanks for joining us for Lady Anne's Stamp Challenge. Sara, this is so cool! Love that bat paper. Wicked! Fabulous card...Thanks for playing along with us at Divas by Design this week.